Brian Smith of Elgin Ridge Wines and Niels Verburg of Luddite yesterday launched the. 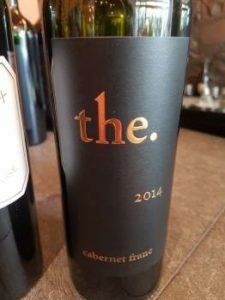 Cabernet Franc 2014, available at R15 000 per three-bottle case, effectively making it the second most expensive wine in the country (behind 4G 67 Imizuzu 2014 at R5 600 a bottle and ahead of De Toren’s Book XVII 2015 and The Black Lion 2016, both of which sell for R2 500 a bottle)*. “SA wine is still not being taken seriously in the rest of the world. We must get prices up or vines are going to come out. This wine is about putting a stake in the ground,” said Verburg about the new project. In an effort to demonstrate competitiveness, Smith and Verburg showed their wine next to Bordeaux First Growths Chateau Margaux 2013 (available from UK wine merchants Berry Bros. & Rudd at ₤1910 per 6-bottle case, the equivalent of R5 972 a bottle) and Chateau Mouton Rothschild 2013 (₤1 750 per case, the equivalent of R5 472 a bottle). From a Bot River vineyard planted in 1996. Matured for 18 months in French oak, one new barrel, one second-fill and one third-fill. On the nose, top notes of fynbos, violets and roses before black fruit, some raw meat and earth. Full bodied but balanced – lovely fruit purity, fresh acidity and nicely firm tannins. What it perhaps lacks in refinement, it makes up for in character. Red fruit, fresh herbs, truffle and some turned earth on the nose. Remarkably light on the palate – which is not to say insubstantial. Pure fruit, fresh acidity and fine tannins. Appears wonderfully composed and elegant. Cassis, a certain olive-like quality plus attractive but pronounced oak-derived character – vanilla and cigar box. Relatively full-bodied with fresh acidity and firm tannins. Slightly awkward at this stage. To view a photo album from yesterday’s launch, click here. *This review originally had the price pf 4G 67 Imizizu 2014 as R4000 which led us to state erroneously that the. Cabernet Franc 2014 was the most expensive wine in the country. The error is regretted. Raat scored 94/100 and is on sale at R475 per bottle. Ten times the price and scoring only 93/100 the. question must be, is this just a statement or April the 1st? even if they called it the Alpha & Omega and present it in a Knysna yellowwood case I would still not pay that nor would any of my wine friends. Brand South Africa needs these wines, we have been shooting ourselves in the foot for centuries including when trade sanctions where lifted, not to mention what the KWV did to our industry prior, etc. You can argue against any highly priced wines, particularly when you know production costs, but wine prices are far from just those and inc a fair amount of smoke n mirrors, perception is reality, etc. If these wines help raise prices across the board – which is easier if the mind of the consumer increasingly associates us with these wines i.e. world class – we need as many as the market will bear. Only a handful of French consumers can afford and/or is willing to pay for Mouton Rothschild or Chateau Margaux. They are not made with any expectation that the average French wine buyer would be willing or able to buy a bottle. It is necessary for the sustainability of our industry for South African wine producers to take themselves seriously enough and have enough confidence in the wines we grow to produce ultra premium wines for connoisseurs and collectors in the global market. An assumption that all products must be priced to be accessible to the average wine buyer is what will continue to hold this industry back. I applaud all producers willing to put themselves on the line and work our way up the ladder of global perception with quality and prices to match. South African wines must place themselves along side the best in the world for the long game. At 900 bottles, I have no doubt that this wine will sell and I congratulate Brian and Niels on this project and wish them huge success. Great news for the industry & interesting to see the volumes of Margaux pumped out at that price. Staggering. We saw headline news across international channels for a Cape wine (Touch Warwick) at auction not long ago. Good to see other leading lights in the industry punching on price and delivering such news for brand SA. Comparing price vs scores completely misses the point, and you’ll be going round in circles for some time on that front. How distressing these days that all value is measured in money. And I have no understanding of the logic that punts such outrageous aspirational pricing as important for South African wine. Oye! I guess at about R4.5 million turnover per year, those vines are staying in the ground! Pity that only seriously rich people will ever get to taste its fruits. Or does anyone know where the fruit went up to 2013? Melvyn, take a look through your art lense at the $450m paid for an alleged da vinci, then the prices other major wine producing countries are achieving for their top end wines, then read your comment submitted here again? Or consider why so many growers are losing money? You appear to reveal an ignorance for cape wine trade economics? I applaud the effort but I’m still wondering who put the labels on the individual bottle boxes because the one image that I saw looked appalling. Sorry guys. I know that’s not a reflection of the wine but really? R5000 a pop and nobody bothered to pay attention to the labels being stuck on properly? Geez.